Rebuttal of the YES campaign's "rebuttal"
The YES campaign posted on its web site around Nov 18, 2017 what’s below in this typeface. We respond below point by point: in short the YES’s “rebuttal” is nothing of the sort, it only aims at confusing voters into voting YES for an unnecessary +3% tax increase on Dec 4. 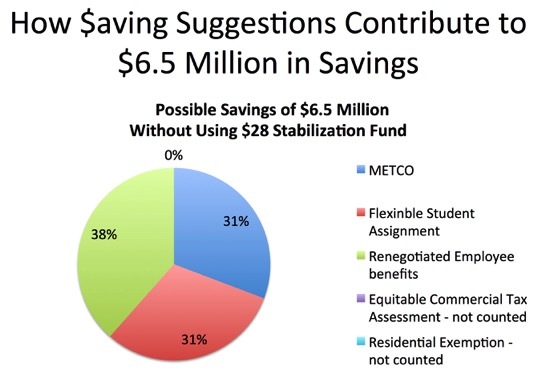 Also, interestingly the YES campaign does not even try to argue that our 243 METCO students now cost us $2 million (possibly more) annually beyond the State’s $1.5 million METCO subsidy. As our enrollments rise so fast, 243 more children in our schools are sure not “cheap” for our budget — the average school budget cost to educate each of our 7,163 students is $16,054 per year. Opponents of the December 4th debt exclusion have raised questions about the size and timing of this debt exclusion. Indeed: the projects can be built without “exempting” (the key word the voters have a say on on Dec 4: see ballot questions) their $6 million annual peak debt service from the limits of Prop 2 1/2, i.e. without any +3% tax increase beyond the +2.5% annual tax increase allowed under Prop 2 1/2, if savings such as the following are implemented — which would free up more than the required $6 million in debt service. Incorrect: as this analysis shows, ALL elementary classrooms would have less than the “maximum” allowed number of kids per existing Lexington Schools’ policy (20 in Kindergarten, 24 in grade 1 and 26 in grades 2-5). and ignore the 2.5% enrollment growth our district is experiencing every year. No: this analysis is as of Oct 1, 2017 and similar analyses as of Oct 1 of all recent previous years showed that our classrooms were not close to the “maximum” each and every Oct 1 in years past. The Schools can replicate this analysis at any point in time within any school year they wish (they have not done so), but no data is publicly available allowing us to do so at any other point in time than Oct 1. No, we say nothing of the sort, because all assessing rules are set by the State’s DOR. We say that the Selectmen should work with Beacon Hill and with the State’s DOR to change their current commercial assessment rules which hurt all of Massachusetts’ 351 cities and towns, but Lexington particularly because we have the highest number of schoolchildren per taxable lot of any city or town in Massachusetts, and that number is rising, so Lexington suffers particularly hard from the missed revenues resulting from current under-assessments of commercial properties. offer tax relief, and repackage employee benefits. No, they have not been even looked at, except for a residential exemption, 13 years after it was first proposed, let alone “duly considered”: if any such “consider[ation]” had happened, reports or working groups would exist, and it would have been rational for the Town and/or for YES supporters to make such reports public (like this presentation), if anything so this NO campaign’s arguments could no longer be made when the next debt exclusion or operating override comes up for a vote. We wish we knew WHY our proposals (minus the residential exemption, 12 years too late) have never been looked into — but we don’t. If anyone reading this knows, please contact us. involved in the Town’s master planning work over the last ten years. The Town does no “master planning” as it is understood in any well-run company or watchful household’s budget. For example, the Town can show no timeline about how a $100 million, or $200 million, or $300 million, or higher, high school renovation or rebuilding can be financed in the future. The Town has no 5-, 10- or 20-year outlook of its operating budget, to see whether our budgets are even sustainable in light of our rising school enrollments. This page lays out the the Yes! For Lexington position on each of these claims. 1. The school system ignored $2 million in potential savings using flexible student assignment strategies. The schools have not ignored these supposed savings. That’s unfortunately not true, the Schools have ignored possible savings: a policy (its last paragraph states “The Superintendent is authorized to make exceptions to attendance lines for individual children in the best interests of the student and/or the school.”) voted in December 2016 was ignored on Oct 1, 2017 since we still have in this school year 2017-18 many empty spaces in many elementary classrooms — filling those empty spaces would have saved, minus 10 non-“new” to Lexington kids having to move to another school, almost all of the 16 classrooms, as described here. None of our School or Town leaders have even seriously considered this proposal; when the Chair of the School Committee met privately with the Chair of this NO campaign on October 30, 2017, and looked at this spreadsheet, the questions he asked made it clear that he had never looked at this analysis seriously before. A meeting he asked the School Superintendent to hold with the Chair of this NO campaign shortly thereafter has not happened as of this writing (Nov 19, 2017). Indeed, we would prefer that the guidelines for “maximum” size be say 17 instead of 26 kids max per classroom — but even our current School Committee has not changed the current policy because it’s VERY expensive even to lower the 26 to 25, for obvious reasons: the main cost of running a school system is teachers’ salaries and health benefits, and the lower the max per classroom is, the more classrooms (therefore teachers) the system needs. Finally, something that is CORRECT: we cannot model these second-order costs because we do not have the necessary data (transportation routes depend on where individual kids reside, and we do not have access to such data; the hiring of over-max aides depends on when throughout a school year new kids move into Lexington, and we also do not have such data). This NO Campaign has said publicly that it is ready and willing to work on refining this analysis to account for all such indeed “complex” issues, but second-order vis-à-vis reducing the overall number of teachers needed to educate our 3,153 elementary students, but we are still waiting for our offer to be taken up. Fails to acknowledge that five of our elementary schools are already serving significantly more children than they were designed for. The School System has taken cost-saving measures to postpone the inevitable necessity of rebuilding Hastings and adding capacity to accommodate our 2.5% annual growth in enrollment. That is why this NO campaign says we MUST indeed build a new Hastings school, but we can and must do it WITHOUT raising taxes beyond Prop 2 1/2, therefore the correct answer on Dec 4 is NO on the Hastings question. but they have not solved the overarching problem: our enrollment continues to grow. Indeed, and since the Town and Schools don’t have ANY 5-, 10- and 20-year outlooks at our operating and capital budgets (which should use our best estimates of future school enrollments with scenarii of low, medium and high since no one has a crystal ball), the Town and Schools have no clue whether we will be able to balance our budgets, or whether we will need tax increases of 10%, 30%, 60% or 100% or even more to do so. Nobody in Lexington knows, not the YES or NO campaigns, and not any of all the following of our very hard-working staff people or Board and Committee members: our Town Manager, Schools Superintendent, the Selectmen, the School Committee, our financial Committees. Given current and projected enrollment numbers, simply moving children in and out of classrooms cannot reduce the system-wide overcrowding in our schools. We agree, but “simply moving” just 10 non-“new” to Lexington kids would save in the order of $2 million of taxpayers’ money annually, and would free up 16 classrooms at no cost to taxpayers — something VERY useful as our enrollments rise year after year. Yet as of Oct 1, 2017, the Schools did not even implement their new December 2016 policy regarding “new” to Lexington kids, thereby wasting taxpayers’ money unnecessarily. 2. Raising Town employee salaries and reducing the Town’s contribution to employee health premiums save $2.5m/year? The town cannot unilaterally make changes to employee health insurance. Any change would require renegotiation of multiple union contracts, which is neither quick nor simple. We know all of this full well, of course. Further, the changes proposed don’t directly lead to savings. That is correct: that is why serious study is necessary by the Town before any win-win package can be proposed to our unions. Our analysis is the most one can do without access to employee-specific information, which the Town has, but which no other entity or individual can nor should have access to. No, not “poor enough”; our employees are smart and reasonable people; if married, they look at Lexington’s benefits (85% of premiums paid by the Town) and at their spouse’s employer’s (say IBM paying 70%): they will rationally take Lexington’s benefits because that will cost the family 15%, whereas IBM’s plan would cost 30% of similar premiums (Lexington’s health plans are comparable in features and premiums to plans offered by large companies). a significant number of employees will abandon the benefit and obtain health insurance elsewhere. Whether the YES campaign likes it or not, subscription rates do drop for towns whose “85%” is lower than 85%, and the more so when their “85%” gets close to the minimum mandated by State law, 50%, as Concord does. And the thousands of employees in towns like Concord, Lexington, Burlington, Woburn, etc are similar, they are teachers and municipal workers, so as rational, thoughtful decision-makers who want to maximize their overall take-home compensation, the law of large numbers is very likely to apply in Lexington just as it does in these other communities and we would also see a drop in subscription rates to health plans in Lexington if our 85% dropped to 50% (or to some other, significantly lower than 85% percentage). But serious, detailed studies must be done by the Town before a proposal can be made to our unions (what about retirees? before-tax vs. after-tax dollars? to cite just a few of the second-order issues to look at beyond the major benefit to Lexington, a drop in subscription rate if our 85% was less sky-high vs. the general marketplace — and the Town has conducted no such studies, preferring to air directly, or let a YES campaign air incorrect or unfounded assertions like “this won’t work; the unions won’t accept it; it’s a pipe dream” etc. instead of rolling up its sleeves to save taxpayers’ money. Taking a more practical approach, Lexington instituted a program in 2015 which allows employees to opt out of healthcare benefits in return for a small cash payment. This has realized some savings while maintaining our ability to attract and retain talented professionals. Yes, “approximately $361,000 in FY17” according to note 3 in table 6, page vi of the Town Manager’s Report in his FY18 Recommended Budget and Financing Plan, which is wonderful but minuscule compared to the $2.5 million the Town could save by raising PERMANENTLY ALL annual salaries by $7,000 in exchange for a drop of our current 85% to 50%. We knew this from our interviews with a couple dozen cities and towns when we developed our model in 2010 because all told cities and towns we spoke to told us so: employees are very reluctant to “opt-out” if the deal is not PERMANENT, because employees are not sure that they will have access to good health care the following year at a reasonable cost should the opt-out plan no longer be offered next year. 3. The Town drastically under-assesses large office buildings to the detriment of Town finances. The Town follows procedures that are established, reviewed, and strictly enforced by the State Department of Revenue. Changing these procedures is completely outside the Town’s authority. Following these procedures protects the Town from potentially costly penalties that could result from following the No Campaign suggestions. Furthermore, adjusting the relative balance of assessments in Lexington will not generate additional tax revenue. Incorrect: to take just one example, the Town never increased the assessed value of 95 Hayden Ave after it was up-zoned by Town Meeting, which instantly added $16 million to its market value. Furthermore, if the current huge under-assessments disappeared, we would see a shift in the tax burden away from residential taxpayers to commercial ones — effectively a tax cut for homeowners, which would be quite welcome when a much larger than this +3% tax increase is at the ballot box, for the high school for example. In other words, even if the State Department of Revenue agreed with the No Campaign (which they decidedly do not), this debt exclusion would still be necessary. Yes, which is why we do NOT count this proposal among the 3 that yield more, if finally implemented, in savings than the $6 million needed to cover the debt service for the 3 projects we want done out of current tax levels, with no +3% tax increase: $2 million (elementary classrooms) + $2.5 million (health premiums at 50% instead of 85%) + $2 million (eliminate METCO deficit) = $6.5 million, more than the $6 million needed for the debt service. 4. The Board of Selectmen should implement a "residential exemption" to lower taxes on smaller homes and raise taxes on larger homes. The State and Town both offer numerous means-tested property tax relief programs to seniors, residents with disabilities, and veterans, including a generous tax deferral option. As the No Campaign acknowledges, the Board of Selectmen is re-examining the use of a residential exemption, but this would not come into effect for at least two years. And, as with the claim regarding commercial assessments, a residential exemption does not generate additional revenue for the Town, meaning that this debt exclusion is still necessary. Yes, this is all true: why did it take 12 years of inaction for the Selectmen to finally see how good a move it would be to cut taxes on small owner-occupied houses while raising them on everyone else, especially large $1.5 million plus houses, via a residential exemption? A residential exemption aims, for this NO campaign, at keeping our town economically diverse so that the elderly and people with limited income and assets don’t feel they have to move to Woburn or Burlington or Bedford, or elsewhere, to escape Lexington’s relentlessly rising taxes (each time this happens, a new family with 1, 2, 3 or more children may move in, adding to our budget woes since the schools are the main share of Lexington’s overall budget: see pie chart on page 6 of this report, where in addition to 49% of the budget [the light green area], the schools also account for the vast majority of “Benefits & Insurance”, “Facilities” and “Cash capital”). We did NOT include a residential exemption in our $6.5 million calculation above which makes the +3% tax increase from the Dec 4 debt exclusion, should it pass, unnecessary. 5. The town will move forward with these projects regardless of the vote’s outcome, therefore residents risk nothing by voting No. The funding for all three projects was approved contingent on a Yes vote for the debt exclusion. None of these projects can proceed without a Yes vote until Town Meeting approves a new appropriation. Not true. Except for the Hastings project (see below) another Town Meeting can appropriate funds to do the projects (after we save $6.5 million from our proposals, or another amount from other money-saving opportunities, if they are finally implemented), and the projects will be done without this unnecessary +3% tax increase. Any new appropriations would come at the cost of other services and programs valued by residents. Without excluded debt financing, projects would be reduced in scope, resulting in lower benefits to residents. This would also limit the use of the Capital Stabilization Fund for tax mitigation. An important thing the YES campaign conveniently forgets to tell Lexingtonians is that our Capital Stabilization Fund now has $28 million in it because (1) Lexington started enjoying multi-million dollar savings on its health benefits costs once it joined the State’s Group Insurance Commission (GIC) — unfortunately years after some people in town first said Lexington should join GIC, right after Brookline did —, and (2) after that, the Selectmen did NOT reduce our tax rates, but instead continued to tax us at the maximum allowed (called the “levy limit” under Prop 2 1/2 technical jargon), even though they could have balanced our operating budgets with lower taxes. So the $28 million are all taxpayers’ money that could instead still be in our wallets, if the Selectmen had not taxed us at the full “levy limit”. Some people feel that they could get a better return on their money than the Town gets on the $28 million (approximately 1% per year) for their portion of taxes they paid into that $28 million, had the Selectmen not continued to tax us at the “levy limit” after Lexington joined GIC and the corresponding savings materialized. The single greatest loss to the Town would result from a rejection of the proposed Hastings School, which is slated for $16.5 million in matching funds from the state. If we vote no on this project, we effectively reject a quarter of the cost of rebuilding a much-needed 30-classroom school. This is simply not true — a basic “scare the voters” tactic to try to get them to vote YES on Dec 4. We, the NO campaign, presented this timeline to the Selectmen during the Public Comments section of their Nov 13, 2017 meeting. If the Hastings question fails on Dec 4, as we recommend it should, and if the Selectmen have not scheduled in time a Special Town Meeting to revote the Hastings funding but NOT contingent on passage of the Dec 4 Hastings question, the Selectmen, not the voters, will be the only ones to blame if the MSBA cancels their $16.5 million grant for the project because the 120-days deadline has not been met by Lexington — by not scheduling a Special Town Meeting in time, the Selectmen are effectively gambling on passage of the Hastings question, and the voters should neither be blamed, nor scared into voting YES. Also, following our public records inquiry with the MSBA, the MSBA emailed us (on Fri, Nov 17, 2017 at 4:37 PM which we forwarded to Nicola Rinaldi, co-chair of the YES campaign on Fri, Nov 17, 2017 at 8:54 PM and to the Selectmen today, Nov 19) saying “In the past, the MSBA has extended the 120 calendar day term for the Project Scope and Budget Agreement.” so Lexington may still be able to convince the MSBA to extend its 120-days deadline if the Hastings question fails and the Selectmen have not convened a Special Town Meeting in time. 6. If the Town votes No on the Lexington Children's Place, then Hastings can be funded using the Capital Stabilization Fund without a debt exclusion. This idea would require the Town to complete the funding of Hastings using at least $20 million of "within-levy" debt (debt that is not excluded from Proposition 2 1/2). Aside from a rejection of the benefits created by a new LCP, the argument assumes that the MSBA would agree to such a funding plan, which is a dubious and risky claim. It would also create serious pressure in the Town's operating budget at a time when we should be preparing to handle the unavoidable increases we anticipate in our operating expenses. We answered the YES campaign’s “MSBA loss of $16.5 million” false assertion above. There are many ways the Town could fund the 3 projects within “levy limit” — the $6.5 million in savings from 3 long-overdue initiatives being only one way to do it. We welcome other ideas — but our leaders, and certainly the YES campaign, find it easier to increase taxes than to look for such new ideas.